You have to admit, these look pretty tasty. This falls into the first category. Who would think that you could make a delicious dinner with a few mushroom caps, a couple eggs, some bread crumbs and a little cheese? My spouse and I attended a fundraiser for a client of mine on the weekend, Ross Creek Centre for the Arts in Canning. For the past three years I have designed the posters for Two Planks & A Passion Theatre as pro bono work. The night consisted of an auction and dinner served by a Valley caterer. 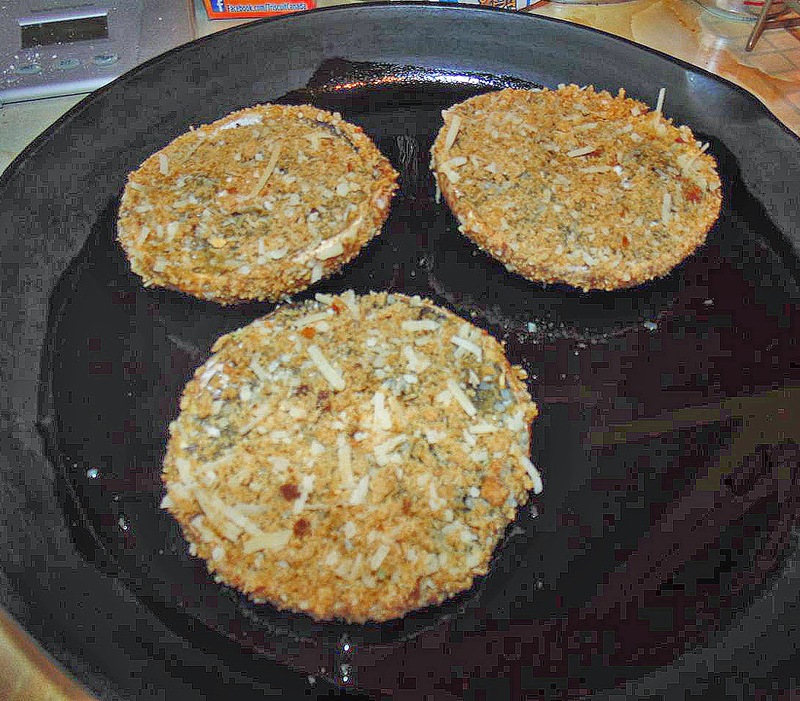 Part of the dinner were breaded portobello mushroom caps. They were pretty darn good. Almost as good as the shrimp...almost. I made three. Don't shame me... I'm a gourmand and admit it. And it was. Actually I believe, breaking my arm patting myself on the back, mine were better. They turned out deliciously with a nice, crispy crust. The only “problem” was what to serve with them. I knew it should probably be pasta because I made the breadcrumbs Italian flavoured. I did not choose a tomato-based sauce. The reason was I already had 3/4 of a sauce sitting in front of me after breading the mushroom caps. I took my cue from Carbonara. The final technique when you make Pasta Carbonara is to mix an egg and milk into the hot pasta, cooking it in the process. Well, the egg dip was just sitting there. Why waste it? This vegetarian dish is surprisingly quite filling. In fact, I didn’t feel the need to have anything else (much) in the way of snacks through the evening. I suppose, there was a gut-load of carbs in the pasta. This one’s a keeper, and it’s so very easy. I have a vegetarian friend – and many others – that would love this, I’m sure. Preheat the oven to 425°F. Heat the oil in an oven-proof skillet and keep warm. 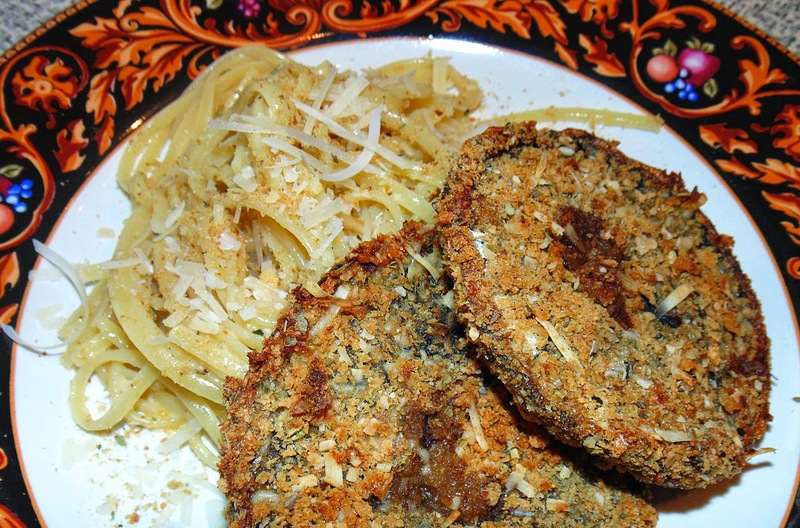 Mix together the ingredients listed for the Italian bread crumbs on a plate. Remove 2 tablespoons of this mixture and set aside. In a soup bowl, beat the two eggs until broken up. Place the flour in a plastic bag. Now you’re ready to do bound breading! 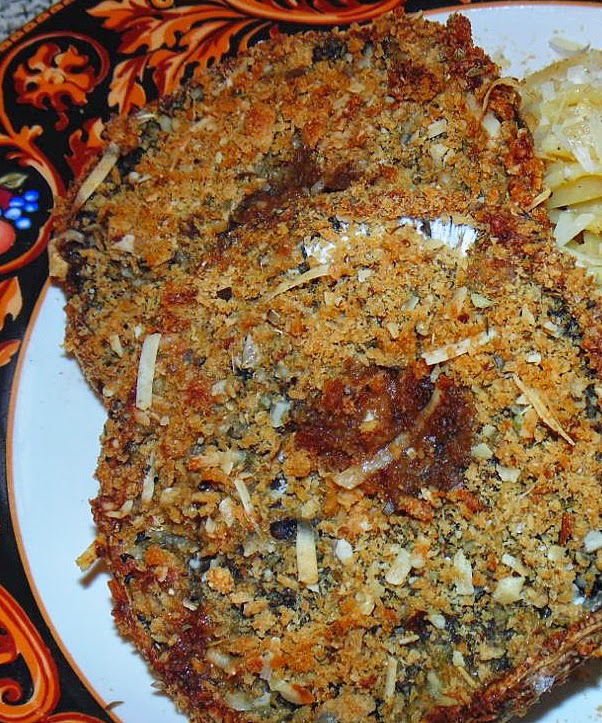 Coat a mushroom cap in the flour, dip in the egg making sure it’s well covered, then coat in the bread crumbs. Place gill-side up in the warm skillet. Repeat with the remaining caps. Place the skillet in the hot oven. Bake the caps for 15 minutes, or until golden brown. To the remaining egg mixture, add the milk, oregano, salt and pepper. Cook the pasta according to package directions. Drain and place back in the pot. While the pasta is still hot, slowly pour in the egg mixture, stirring constantly. Serve two caps per person. Top the pasta with half the reserved bread crumbs and some grated parmesan.